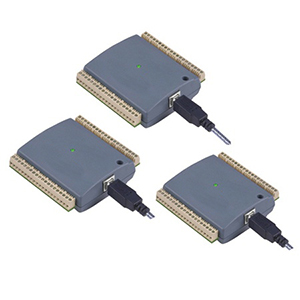 The OM-USB-1208FS, OM-USB-1408FS and OM-USB-1608FS are USB 2.0 fullspeed voltage input data acquisition modules (fully compatible with both USB 1.1 and USB 2.0 ports). These are plug-and-play modules which draw power from the USB cable–no external power supply is required. All configurable options (including individual channel ranges) are software programmable, and the modules are fully software calibrated. The OM-USB-1208FS and OM-USB-1408FS feature eight analog voltage input channels that are processed through a single A/D converter. The analog inputs to the OM-USB-1208FS are software configurable for either eight 11-bit single-ended or four 12-bit differential inputs. The analog inputs to the OM-USB-1408FS are software configurable for either eight 13-bit single-ended or four 14-bit differential inputs. The OM-USB-1608FS offers true simultaneous sampling of up to eight 16-bit single-ended analog voltage input channels which is accomplished through the use of an individual A/D converter per channel. Models USB-1208FS and USB-1408FS have 16 independent digital I/O channels and model OM-USB-1608FS has 8 digital I/O. All modules have one 32-bit counter channel. The digital I/O channels are software programmable for input or output. Additionally, models OM-USB-1208FS and OM-USB-1408FS have two 12-bit analog outputs. The packaging for the OM-USB-1208FS, OM-USB- 1408FS and OM-USB-1608FS ensures ease of use in a variety of applications. The OM-USB-1208FS, OM-USB-1408FS and OM-USB-1608FS modules ship with an impressive array of software, including the new TracerDAQ®, a full-featured, out-of-the-box data logging, viewing, and analysis application. Driver support and detailed example programs are included for Universal Library programming libraries for Microsoft® Visual Studio® programming languages, and other languages, including DASYLab®, and ULx for NI LabVIEW® (comprehensive library of VIs and example programs compatible with 32-bit and 64-bit LabVIEW v8.5 through 2012) and InstaCalTM installation, calibration and test utility-powerful solutions for programmers and nonprogrammers alike. These modules operate under Microsoft Windows® XP (32-bit only) and VISTA/7/8 (32-bit and 64-bit) operating systems. TracerDAQ PRO is an enhanced version of TracerDAQ. A comparison of some of the features included in TracerDAQ vs TracerDAQ PRO is shown on PDF. Configuration: Each DIO bit can be independently configured for input or output. Power on reset is input mode. Pull-Up/Pull-Down Configuration: All pins pulled up to 5V via 47 kΩ resistors (default). Pull-down to ground (GND) also available. Digital I/O Transfer Rate (Software Paced): Digital input: 50 port reads or single bit reads per second (typical); digital output: 100 port writes or single bit writes per second(typical). 참고: All models include a 1.8 m (6') USB cable, software and user manual on CD.